Fresh fruit and vegetable juices are a powerful way to increase your antioxidant intake for better health and lowering your risk of many serious diseases. Higher fruit and vegetable intake is strongly associated in research studies with a lower risk of diseases like cancer and heart disease. This is commonly attributed to fruit and vegetable consumption increasing your intake of antioxidant phytonutrients that work to prevent free radical damage in your body. Ahead is why juicing is such an effective way to improve your health and prevent diseases. A look at the best fruits and vegetables for reducing your risk of heart disease, cancer, digestive disorders and liver and kidney problems. And a combined juicing recipe that uses all of these in a concentrated and great tasting shot of antioxidant disease prevention. Many different kinds of antioxidants become concentrated and more easily absorbed when fruit and vegetables a freshly juiced. Lycopene, quercetin and beta-carotene are some of the more well known antioxidants, but there are a wide variety of others. These phytonutrients work in complex ways to prevent diseases within your body, but one of their primary effects is to prevent oxidative damage from free radicals. Cellular oxidative damage or stress occurs when certain cells become damaged during oxygen metabolism. The term free radicals is used describe affected cells that are missing a critical molecule. These cells will then steal that missing molecule from other cells nearby, often injuring the neighbouring cell, damaging its DNA and potentially starting a dangerous chain reaction. This is thought to be a precursor for diseases like cancer. Normal cellular activity will always generate a small amount of free radicals. This is not generally a health problem as your body’s natural antioxidants deal with these effectively and minimize the damage. Problems can start though when we overload our bodies with far too many sources of free radicals. Cigarette smoke, the chemicals in processed foods, alcohol and pollution and other environmental toxins are all big sources of free radicals that produce oxidative stress. When your intake of free radical causing compounds is high (and it could be argued that just living in a polluted city and eating supermarket food qualifies), your body needs many more antioxidants to deal effectively with the extra oxidative stress and prevent cellular damage. This is where fruits and vegetables are so important and one of the main health benefits of juicing. Regularly making up fresh vegetable and fruit juices will naturally increase your body’s overall available antioxidants to deal with free radical damage. 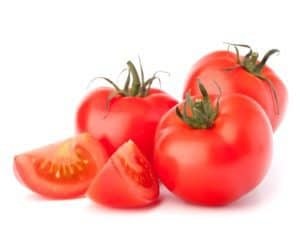 Lycopene from tomatoes and watermelon for instance has been shown to protect against cholesterol oxidization, one of the potential causes of cardiovascular disease. Alpha carotene intake from carrots and leafy greens is strongly associated with a lower risk of many types of cancers. While the beta-carotene found in lots of the fruits and vegetables ahead may protect against a variety of diseases. Carotenoids like beta-carotene and lycopene have even proven effective as a natural sunscreen against UV damage that leads to photoaging of the skin and skin cancer. Eating more fruits and vegetables is highly beneficial and does include the fiber and other nutritional elements that may not be captured in juicing. But it can be very difficult to eat anywhere near the amount of raw vegetables and fruits as you can easily concentrate into a delicious glass of freshly extracted juice. Juicing for health is so attractive because it’s such a simple and enjoyable way to get a potent dose of free radical quenching antioxidants and other important nutrition like vitamins, minerals and enzymes. If you get serious about juicing, then consider looking into a better quality masticating juicer. Masticating juicers crush and squeeze the juice out of produce rather than just shredding the pulp. They are much easier to clean and produce both a better quality and a much larger quantity of juice. So while they are more initially, in the long-term they make much more sense for your health, for ease of cleaning and for your wallet. While virtually all vegetables and the majority of fruit are good for juicing to increase your antioxidant intake against diseases, a few are especially beneficial for certain health issues. 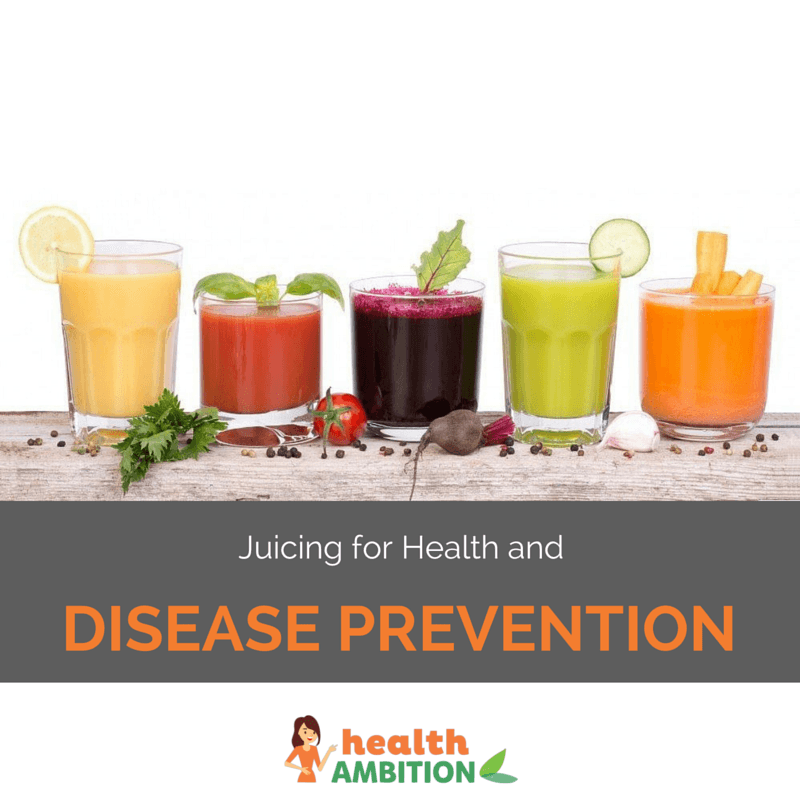 Let’s look at heart disease, liver dysfunction, kidney problems, cancer and digestive disorders and two specific juices for each for topping up your defences. Following this is an antioxidant rich juicing recipe combining all of these for an incredibly powerful way to boost your daily cellular protection. Tasty tomatoes are one of the best sources of lycopene, a premier antioxidant that is exceptional for preventing cholesterol oxidization within your cardiovascular system and guarding against heart disease. Tomato juice is rich and satisfying and well worth adding to any juicing recipe. 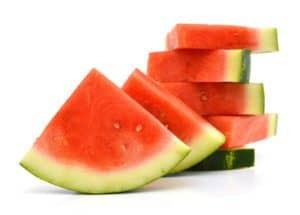 Sweet watermelon is also a good source of lycopene and additionally contains high levels of citrulline. This amino acid is converted to arginine which relaxes blood vessels, helping to reduce high blood pressure, another marker of heart disease. Scrub your watermelon skin first and then juice the whole lot, skin and all. Much of the citrulline is contained in the white rind so it’s good to include when you’re juicing. 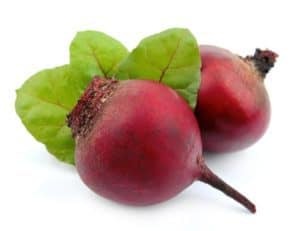 Beets are an excellent liver detoxifier and special substances in them can even help to regenerate healthy liver cells. 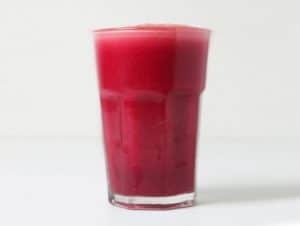 Deep red beet juice is perfect for livers that are regularly burdened with processing out alcohol and the chemicals and toxins in many packaged foods. Delicious apples contain a wealth of flavonoid antioxidants and add a natural sweetness to any juice. For this reason your find them in many juicing recipes for better health. 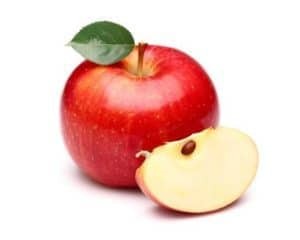 The healthiest part of the apple is the skin and just below. Unfortunately conventional apples are usually sprayed and waxed. Organic apples are much better but if you can’t find these then soak your apples in warm water and a splash of apple cider vinegar and scrub them with a small scrubbing brush. Good advice for any non-organic produce that you’re preparing for juicing. 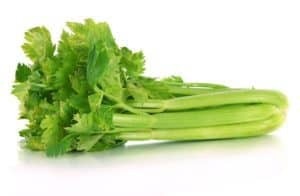 Celery is a potent detoxifier and celery juice is especially cleansing for your kidneys. A natural diuretic that gently eliminates excess water weight, juicing celery can help your kidneys to eliminate more toxins from your body. 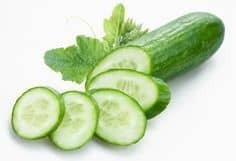 Freshly juiced cucumbers are recommended as a kidney tonic and are even suggested to help breakdown kidney stones. Cucumber juice is highly alkalizing and hydrating, tastes great and is even good for your skin. Like apples and celery, cucumbers are much better organic or soaked and scrubbed to minimize sprays and waxes. 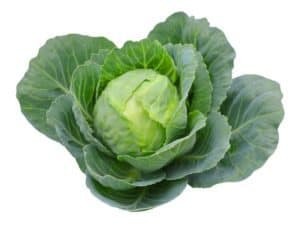 Cabbage juice may not sound that appetizing, but it’s very good for gastrointestinal issues and especially for preventing or even treating stomach ulcers. The glucosinolates in fresh cabbage juice are converted to anti-inflammatory isothiocyanates in your body. These soothe the digestive tract and control the Helicobacter pylori bacteria that is known to cause stomach ulcers. 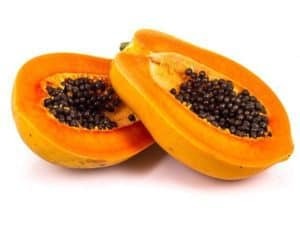 Papaya juice adds a rich tropical flavor to any juicing recipe and is another antioxidant rich fruit for better digestion. Papaya and particularly its skin contains the digestive enzyme papain which assists in breaking down difficult to digest proteins. Gently scrub the papaya skin with a splash of apple cider vinegar and include it in your juices if you’d like to increase their benefits to your digestive system. Kale is an amazing superfood, full of many vitamins, minerals and phytonutrients. Of particular interest for juicing for cancer prevention is it high levels of organosulfur compounds that have been shown to have an anti-carcinogenic effect against many cancers. Sweet carrot juice is full of beta-carotene, alpha-carotene and other cancer protective antioxidants. Mineral rich and alkalizing, carrot juice is often considered a wide-ranging health tonic that can protect against many diseases. 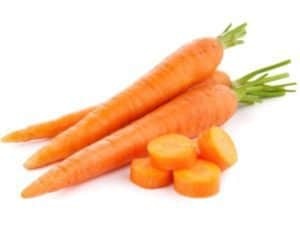 Organic carrots are important though as this vegetable absorbs toxins alongside nutrients in the ground it is grown in. Juicing protocols have been used successfully to heal people from cancer. It’s vital though to seek out an experienced holistic healer if you intend to follow this treatment path. Such a serious disease as cancer needs the guidance of a professional that will consider all potential treatment options and work with the body to heal itself. This juicing recipe for disease prevention and better health in general is a combination of all of the 10 antioxidant rich fruits and vegetables above. You might not always have all of the ingredients and it’s fine to add the equivalent of other produce to make up for what you’re missing. That said, I would recommend making it up with all of the 10 ingredients at least once for a really interesting medley of flavors and a powerful glass of cellular protection. A slice of watermelon, around 2 inches thick and 5 inches deep. Add double for an easy way to increase the amount of juice. Around a fifth of a large papaya with the skin on. 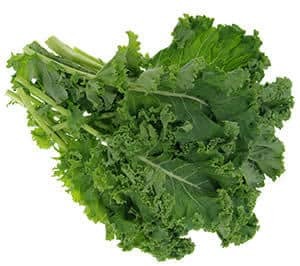 A large branch of kale. 1 large or 2 small carrots. Soak, scrub, chop and prepare your produce as needed to fit through your juicer. Add the juice of a lemon or lime from a separate citrus juicer to your collection jar and a couple of ice cubes. This helps prevent juice degradation and increases the health benefits of juicing. It’s generally better to alternate soft produce like tomatoes, watermelon, cucumber, cabbage and papaya with harder ones like beet, celery, kale, carrots and apples. Apples are good fruit to finish with as they help push the last of the juice out. They also oxidize quickly so are best cut up last when preparing produce for juicing. As soon as you’ve made up your juice stir it up and drink immediately for the most antioxidants and health benefits. If you really do want to keep some for later you could freeze the excess juice in a plastic cup. When you’re ready to have it leave it at room temperature for an hour and then scoop out the juice with a teaspoon as a frozen treat. I hope this page has provided some inspiration to get into juicing for improving your health and preventing diseases. It really is one of the easiest and most effective ways to quickly make a noticeable difference in your overall vitality and well-being. Try it daily for two weeks – in the morning before you get your day started or when you first come home from work in the evening. The difference juicing can make to your health is significant, even in the short term. Longer-term it may well be the perfect antidote to the common diseases of our toxic environment, diets and lifestyles.